Today we are like Heracles, lovely readers. Because we’ve cut off – or at least very badly scratched – one of the hideous heads of the monstrous Hydra. Activision recently told investors that there’s been an industry-wide dip in pre-orders, and this is an excellent thing. It’s proof that we’re finally starting to realise that pre-orders are completely pointless in the modern industry, and that we’re not so easily manipulated by ham-fisted incentives and ridiculous store-specific tat. The illusion of limited stock has been broken, and absent its source of power, pre-orders are going the way of all monsters: left in the past. Pre-orders weren’t always bad news. Back when demand for games was small enough so that publishers didn’t distribute too many copies to shops, but large enough so that stock got snatched up quickly, pre-orders were imperative. This was especially true if you wanted to guarantee a copy on launch or, in some cases, on launch week. That’s behind us though. On PC, digital platforms rule the roost, and the removal of physical media takes limited stock out of the equation. Even with physical copies, it’s rarer to see new games run out, and if they do, there are always online retailers with warehouses full of the newest releases. But this isn’t a new thing. Steam, GOG, Amazon, GMG, these are weapons we’ve had in our arsenal for years. So for a good long time, pre-ordering continued, not out of necessity, but because of marketing. Publishers knew they could no longer rely on offering rational reasons for people happily pre-ordering, so they had to incentivise with exclusive DLC and bonus content. It grew and it grew, getting retailers in on the game, putting together countless special editions so they could get even more pre-orders, even making trailers to make sure that you knew that you could totally promise to buy this game you’ve never played nor heard opinions about. And why? So you could play an extra mission or get a different skin, things that would be sold to others later, maybe even when the game is cheaper? The issue isn’t so much that people can get exclusive DLC, it’s attaching that to a pre-order is horribly manipulative, punishing those who don’t secure a copy before launch. It brought about a loss of parity, creating divisions. 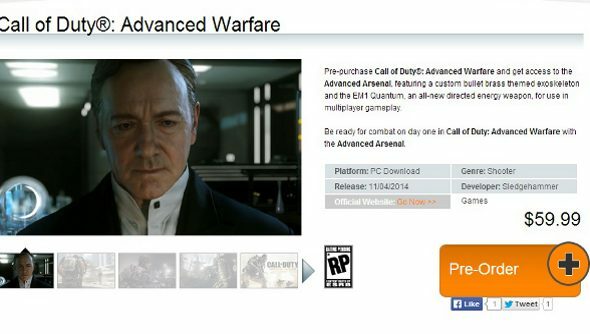 It’s worst of all in multiplayer affairs, where maps are withheld from those who don’t pre-order. Suddenly it’s not just a twinge of jealousy that your mates are getting more of the game, it’s the possibility that you won’t be able to experience it all together. The whole practise comes from a negative place: people aren’t inspired to pre-order because they want something, they do so because they don’t want to miss out. It’s a subtle but important difference. Publishers want customers to feel bad about missing out, not good about getting more missions or maps. There’s something incredibly bizarre about customers making promises to publishers, because that’s what a pre-order is. It’s a promise easily broken, sure, but most promises are. That promise gives publishers and developers at least one free pass to screw up. It tells publishers and developers that it’s more important to market the game well and get those early pre-orders locked down than deliver the promises made to players. Call of Duty gets a lot of pre-orders – though it’s been affected by the decline too – and Ghosts was no different. It’s the worst of the lot, but that wasn’t clear until those pre-orders had turned into purchases. There was no time to read a review, get a mate’s opinions – you were stuck with a pretty ropey game. And it sold phenomenally well. But it’s not looked upon fondly, and the multiplayer numbers are the lowest in the series. The decline doesn’t look like it’s causing issues for Activision, though, and that’s good too. They can win back some faith, and actually get people excited about new games without manipulation. This isn’t some bit of anti-publisher rhetoric. Activision has some cracking properties, and if they’re forced to be better, to find less insidious means to generate interest in their games, then surely we all win?